First grade is officially over! There were a few bumps along the way but for the most part it was a great year. It was Liam’s first year at a private school and the transition took some time but after he learned the ways of his new school it all worked out. I’m so proud of how far he has come this year. I can’t believe all the things they teach in first grade! It is so fast-paced compared to when I was in school. He is an excellent reader and speller. His reading vocabulary tested at almost 6th grade level! I think that’s pretty incredible for a kid who didn’t even speak English his first 2 years! Below is a picture from the award ceremony, where he received an “A” Honor Roll award and a picture with his first grade teacher and his extended day teacher. I’m sad that my little guy is growing up so fast but I look forward to 2nd grade and new adventures. For now, however, he will be chillaxin by the pool for the summer! I can’t believe my baby is already a 1st Grader! He’s off to a great start on the new school year. We made the decision over the summer to move him to a private school this year. Although we loved the elementary school he went to last year — especially the principal Mrs. Voss — we were not happy with the after school options (or lack of) and we were not happy with all the other problems associated with public school. With the population growth of our city in the past year, the public school class sizes continue to rise. Since school started 2 weeks ago, 2 of the elementary campuses are already at full capacity. So we felt that Liam would benefit from a smaller class setting and since we aren’t the best parents at getting him to church, we are very happy that he attends chapel and Bible studies are incorporated into his curriculum. We tested the waters over the summer by enrolling him in the school’s Summer Camp to see if it was a good fit for him. It worked out well and it was nice to see some of the bad influence that he had picked up from the kids at Kindergarten and the after school daycare he was going to last year disappear. And especially after meeting his teacher and hearing all about what the Carden curriculum is going to cover, we’re looking forward to what we hope will be a very successful year of learning! Remember the old board game Trouble with the “pop-o-matic” die-rolling bubble in the middle? Dede bought Liam this game for his birthday back in April and we’ve been playing a couple or three times per week as time permits, and Dede is not busy with online games. Initially of course, he moved his pegs (painfully) slowly around the board, stopping at every hole and often losing count. It was all new to him, so his plays were random and not goal-oriented. Honestly, it was a bit of a chore to get through a game. Now, he jumps his pegs in increments around the board rather than 1 hole at a time. He’s always looking ahead to what his next optimal dice roll should be to land on another player’s peg, and putting some genuine critical thought into which piece is the best to move depending on each roll of the die. And of course, he’s talking trash to intimidate the other players along the way! Sure, we’ve always been big believers in playing analog (not electronic) games and encouraging tactile activities, so ok, maybe this is nothing truly miraculous and shouldn’t come as such a great surprise to me, but it’s just such an unexpected thrill when you actually see firsthand how much this has boosted his math and decision-making skills. You can practically see synapses forming, his dexterity improving, and of course, the big confidence boost he gets when he wins. All that, from playing a simple little board game. Genius! There may not necessarily be anything wrong with digital games—Liam sure loves to play Angry Birds and Cut the Rope on the iPad—but I believe huddling around the table, playing a physical board game has to potential to be so much more enriching. It’s a shared experience with all sorts of social, practical, and cognitive lessons lurking just out of sight. It’s fascinating to watch as your child develops new skills and masters new concepts. And it’s just fun! This makes me nostalgic for the days when all of us cousins would play board games at Pampaw or Uncle Truett’s during holidays. And it reminds me of Rich schooling me on Monopoly. So, now it’s your turn… Are there board games that you’d recommend for those with young children? What were some of your all-time favorite board games? Liam has officially graduated from Kindergarten! It’s been a long year of learning for all of us. We had no idea how difficult the transition from daycare Pre-K to public elementary school Kindergarten was going to be. Apparently life in Pre-K, even though it seemed well-structured, was still mostly about playing and doing things on your own schedule. So going to a class setting where all activities are highly-structured took a bit of a toll on our guy. We thought all hope was lost for the first few months, but after the Christmas break things worked out and he adjusted to the routine and even won a citizenship award by the end of the year. We’re so proud of our little guy and still totally amazed that he can now read books on his own. I’m glad Summer is finally here and we can all relax and enjoy the next few months before first grade starts! Project Vote Smart, founded by former Arizona Senator Richard Kimball, aims to help. This free non-profit, non-partisan research organization collects and distributes comprehensive information on U.S. political candidates and elected officials. In particular, the VoteEasy tool can help you zero in on a candidate based on his/her official stance on a range of key issues or criteria. It even includes historical voting records so you can trend how candidates have performed in years past. I do my part and cast my votes but honestly, I’m still fairly skeptical about the real net value of individual votes in our electoral system (although I’m feeling slightly less iffy about this after some further reading). What are your thoughts on this? Do you feel your efforts at the polls are meaningful? Sadly, there are some things you just can’t get via Netflix (either streaming or disc) so Dede is relieved that we squeaked in Glee: Season 2 just before the hammer fell. According to the ZDNet article Apple Finally Drops TV Rentals From iTunes, Apple quietly pulled the option to rent television episodes from its iTunes online store in the the past few days. Kickstarter is an innovative new website that lets would-be entrepreneurs submit a pitch about a project they need help getting off the ground. Via crowd-sourced fundraising, projects have a set amount needed and defined funding levels—most start at very affordable $5, $15, $25 levels—and in addition to helping get the project going, all “investors” (that’s you and me) get a little something extra as a reward for having some faith in the product and/or its creator. And a project must reach its funding goal before time runs out or no money changes hands, which protects both project creators and investors. A documentary film on the art form of comics by Dave Kellett, creator of Sheldon. My brother Rich has jumped into the fray with his own World Gone 2 the Dogs blog. Head over there and join the conversations! Khan Academy – Free online tutorials! Speaking of Rich, he sent me a link to Khan Academy several weeks ago and I never took the time to check it out. But then just this weekend I read an article in Wired Magazine by longtime fave writer Clive Thompson called How Khan Academy Is Changing the Rules of Education and it really grabbed me. Khan Academy features a library of over 2400 free videos by Sal Khan covering K-12 math, science, finance, history, and many other topics. Each instructional video presents material in easy-to-handle chunks lasting 7-15 minutes. Students can watch videos at their own pace and can even practice math problems online. Be sure to read Clive’s article for more info! Сlassroom rental sounds a good idea for discussions and teamwork. One of the really interesting by-products of Khan Academy and other online video tutorials is that they are enabling teachers to flip the classroom. That is, some teachers are experimenting with the idea of inverting traditional school model, delivering instruction online outside of class and using interactive classroom time for homework. Have you heard about this? We were completely unaware of the concept of planking until our friend Ryan explained it to us last night. You can read all about it here but basically, planking is to lay down (like a plank) in some unusual setting and take a picture to post on the Planking Facebook page. I looked at a few of the pictures and found them amusing. It seems like harmless fun but some do take it to extremes and put themselves in danger to take the photo. 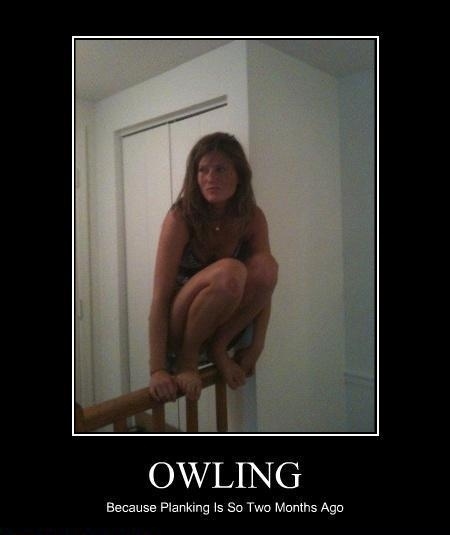 Ryan is into a variant called owling instead of planking because as this poster sums it up, planking is just so two months old! Update: According to Rich, we’re still behind the curve—planking & owling are out, Batmanning, is in! Today was the BIG DAY—Liam’s first day of Kindergarten. It’s a day I’ve been dreading for awhile now. Maybe it’s because I equate starting public school to my baby growing up. But Liam has been excited all summer at the thought of going to his big school. Click here (or the photo above) to view a few pictures from the first day. We walked him into school this morning and stayed until the bell rang for class to begin. He waved goodbye and was ready to begin the day. I’m very thankful that I was not one of the parents that I saw in the hallways that had their children clinging to them in tears. I don’t think I could’ve handled that. According to Liam, in the end, it was an awesome day and he can’t wait to go back again tomorrow! There’s been a surge of articles in parenting magazines, blogs, and news coverage about bullying lately. Children are being tormented in America’s schools and online—sometimes to the point of committing suicide. It’s hard to believe that something I had been so totally unaware of is such a huge problem, yet the media has declared bullying to be a national epidemic. There’s some contention about just how severe this has become; some experts insist that bullying is no more prevalent now than it was back when little boys yanked little girls’ pigtails and that the media’s portrayal is unrealistic and excessive, making behaviors that might simply be cruel into something more criminal. Maybe physical bullying has taken a backseat to psychological or emotional bullying, but even if the media has blown this out of proportion, there’s no denying that bullying is a credible and increasing problem. As a parent, I’m thankful for all of the efforts to shed some light on this problem and I fully support both punishing bullies and helping kids learn to better cope with pressure-filled situations. But maybe we should put forth as much effort looking at some of the root causes. I believe a big contributing factor is how acclimated we’ve become to violence. Horrific, explicit, oppressive violence is now an accepted part of our everyday lives. Remember the movie Robocop about a terminally-wounded Detroit cop who returns to the police force as a powerful cyborg? What you may not recall is that the 1987 movie was initially given an X rating by the MPAA due to its graphic violence. Right, the movie was rated “X” not because of explicit sexual content, but for its shockingly-violent imagery. To appease the requirements of the ratings board, writer/director Paul Verhoeven pulled back on the significant blood & gore in 3 scenes so the movie could be released with an “R” rating instead. Likewise, TV shows even feature a stunning degree of graphic violence. Procedural cop shows like C.S.I. are far more realistically gruesome than that X-rated version of Robocop. Even when the violence isn’t necessarily visually graphic, there’s still some extremely negative behaviors at play. Consider that toddlers now watch wrestling on TV, which was strictly the guilty pleasure of Dads when we were kids—much to the disapproval of most Moms. And where playing video games in our teen years meant shooting squiggly blips to make pixelated aliens disappear, now video gamers are immersed in battles where they fire super-realistic weapons at convincingly-real, three-dimensional opponents who yowl in agony when hit, spurt blood, limp, and finally collapse in a nauseating mass on the ground when they’ve sustained too much damage. (Until recently, this is the sort of thing that only soldiers would have to endure—and sometimes suffer from post-traumatic stress disorder as a result.) Other video games reward players for beating up women, stealing cars, pistol-whipping passers-by, and inflicting varying degrees of terrible carnage on, well, anything that moves. According to some estimates, by the time typical American children reach the age of 18, they’ve already seen 200,000 acts of violence and 40,000 murders on some sort of screen. We’ve allowed our society as a whole to become fully engulfed, acclimated, and accustomed to horrendous, gratuitous violence as a normal component of daily life. Perversely, our society actually savors and glorifies extreme cruelty and destructiveness! And as we’ve become numb and indifferent to negativity and violence, bullying has escalated to epidemic proportions. Surely, that’s no coincidence. Billy Bob Thornton Loves Us!